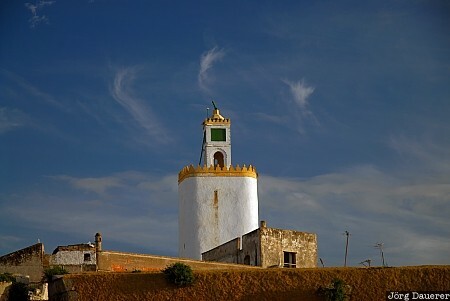 The wall surrounding the Cité Portugaise of El Jadida and the minaret of its mosque in the middle below a blue sky with some white clouds. El Jadida is in Doukkala-Abda in northern Morocco. This photo was taken in the evening of a sunny day in March of 2010. This photo is part of the exhibition White Clouds (February 2012). This photo was taken with a digital camera.